Call Us: 020 8326 6704 · contact@trainhealthcare.com. Individual Login » Company Login » · 0844 243 3700 · contact@trainhealthcare.com. Where relevant, the content of training courses have been verified as aligning to the UK Core Skills Training Framework (CSTF). Our agency training packages are individually designed for healthcare workers to remain compliant on a yearly basis through one simple and easy purchase. The packages include all required mandatory and statutory training, in both face-to-face and online formats at a very competitive price. 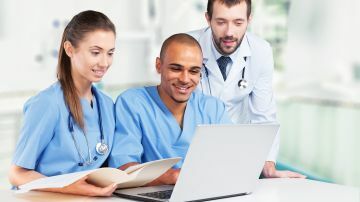 All online and face to face training courses have been assessed by Skills for Health, a non-profit and government accredited organisation, responsible for overseeing the healthcare training standards. Our online training courses are easily accessible and offer a flexible approach to leaning. Our online training is compatible with all mobile devices and allows candidates to learn at their own pace. Our online users undertake more than 50,000 training sessions per year with an excellent pass rate. You will receive your results and have access to your certificate upon completion. Our face to face training courses are a practical and theory based way to learn. We have delivered over 2000 hours of face-to-face training programmes in 2015 and have an experienced team of 15 trainers in over 7 locations nationwide. Courses include Basic Life Support, Manual Handling & Moving of People & Inanimate Objects and PMVA (Prevention Management of Violence and Aggression). Call Us: 020 8326 6704 · contact@trainhealthcare.com. Great West House (GWH-1), Brentford, TW8 9DF.